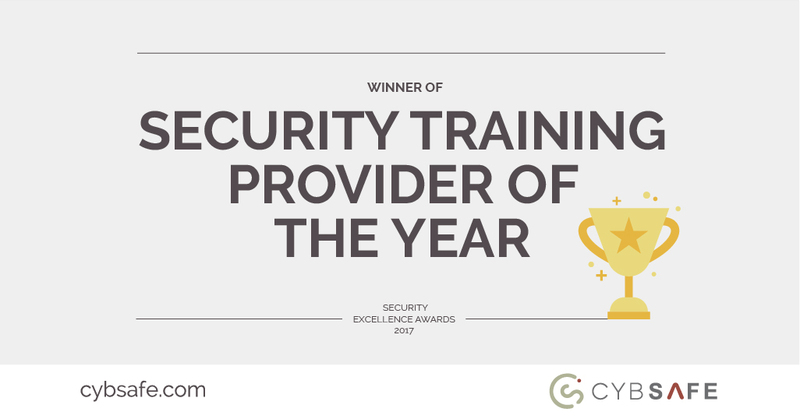 We’re delighted to announce CybSafe has been named Security Training Provider of the Year at Computing’s Security Excellence Awards 2017. The Security Excellence Awards are ‘dedicated to finding and rewarding the top players in the market’ and aim to acknowledge those ‘leading the pack in the security industry’. The ceremony, which took place in central London on the 23rd November, also saw long established players such as Kaspersky Lab, Sophos and Darktrace awarded for their contribution towards countering cyber attacks. The awards recognised companies and individuals through a wide range of categories, including Best Place to Work in Security, CISO/CSO of the Year and Security Professional of the Year. After outranking tough competition, CybSafe scooped the much-lauded Security Training Provider crown. By leveraging insights from psychology and behavioural science, the CybSafe platform aims to address not just what people know about cyber security, but the way people think and feel about the topic. Crucially, it changes the way people behave in practice, making a company’s people yet another robust cyber defence. To find out more about CybSafe, click here to request a demo.